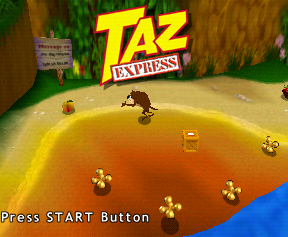 A Europe-only Looney Tunes game starring Taz. A very basic test map exists in the ROM. 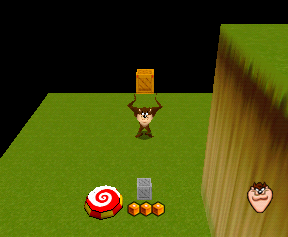 It's a large square area with a spinning pad and a glitched collectible. To access it, enable use this GameShark code and press L after the file select. For some reason, the textures for Marvin the Martian's shoes are included with Taz's textures. Throughout the ROM are a few interesting error messages. Camera stack is full. Ask Jan to make it bigger. How did I get here already? This button has no SWITCH assigned to it. Ste's dodgy key has been moved!!! At 0x97B34 is a trace of the date/time prompt from a certain version of MS-DOS. This page was last modified on 11 December 2018, at 16:39.